Mennonite and Amish dishes were brought into the spotlight with the WBGU-PBS’ national series Amish Cooking from Quilt Country, featuring host Marcia Adams. This how-to series presented farm cooking at its best in a traditional and much more simpler way of life. 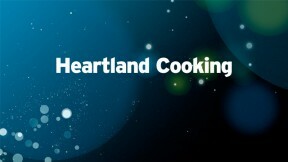 To sequel that success, Marcia and WBGU-PBS branched out to create the 26-episode, Marcia Adams: Heartland Cooking program. As a lifelong resident of the Midwest, Marcia wanted to celebrate this diverse and bountiful region with recipes that captured the culinary essence of the Heartland and its residents. Marcia Adams: Heartland Cooking also went national and eventually won the prestigious CEN award for the Best Informational Series in 1992. Featuring the Midwest’s unique regionalized food, people and restaurants, this series shares the best of the old and new with its viewers. Showcasing mouth-watering recipes that are area-specific Marcia travels far and wide throughout eight states to bring these culinary delights to your living room. Recipes are dressed up with ethnic touches and served with wines from Missouri, Michigan and Ohio to complete the perfect Heartland table setting.